Log into Christy's page on Tirgearr Publishing for an excerpt. Visit Christy at Heart of Fiction where she's talking about her life away from the computer. 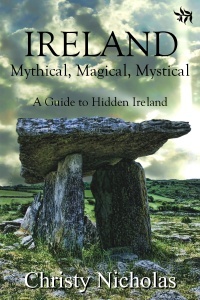 Leave a comment or question with your email address, and enter a chance to win a free copy of this fabulous travel guide for Ireland. It's small town Nebraska in the late 1970's and life in the small Midwestern town is quiet and uneventful. That's what Libby Marshall and Bobby Menedez think until Bobby's cousin, Ramon is beaten by a group of white boys because he is dating a white girl. Libby and Bobby realize that their relationship might make them targets, but they believe their love is stronger than hate. But is it? Something quite evil lies hidden Under the Western Sky. Log into Deallni's page on Tirgearr Publishing for an excerpt. Visit Dellani at Heart of Fiction where she's talking about her life away from the computer. Leave a comment or question with your email address, and enter a chance to win a free copy of Under the Western Sky. Set in 1950s Ireland, twenty-year-old Sarah Nolan leaves her Dublin home after a series of arguments. She's taken a job in Cork City with The Gazette, a move her parents strongly oppose. With her limited budget, she is forced to take unsavory accommodations where the landlord can't be trusted. Soon after she settles in, Sarah befriends sixteen-year-old Lucy who has been left abandoned and pregnant. Dan Madden is a charming and flirtatious journalist who wins Sarah's heart. He promises to end his engagement with Ruth, but can Sarah trust him to keep his word? It's when her employer asks to see her birth certificate that Sarah discovers some long-hidden secrets. Her parents' behaviour continue to baffle her and her problems with Dan and Lucy multiply. Will Dan stand by Sarah in her time of need? Will Sarah be able to help Lucy keep her baby? Or will the secrets destroy Sarah and everything she dreams of for her future? Log into Cathy's page on Tirgearr Publishing for an excerpt. Visit Cathy at Heart of Fiction. Read an article about Cathy's experience with the 2013 Joan Hessayon Award for Shadow Across the Liffey, and read an excerpt from Her Father's Daughter. Leave a comment or question with your email address, and enter a chance to win a free copy of Her Father's Daughter.